The varroa mite is really working a number on honey bees here in America – and we need help. …A four-year field study by the Bee Research Institute in Oberursel, Germany has found that the parasite is at the heart of the problem: “If we keep up our efforts at controlling the varroa mite, many more bee populations will survive,” explains Professor Nikolaus Koeniger, who was the institute’s director for many years; he and his wife have been devoted to studying the varroa mite for decades. As this famous bee expert couple knows, it is horizontal infection that is most dangerous. “Particularly at the end of the flowering period, foraging bees from healthy colonies invade colonies weakened by varroa to steal honey. 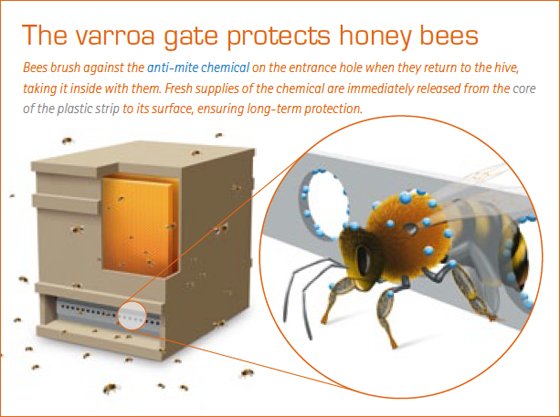 They have therefore concentrated on the strategically most important point, and the joint efforts of the Bee Institute and Bayer have led to the creation of the varroa gate, a structure at the entrance to the hive. Every bee must climb through this gate when leaving or returning to its own hive. At first sight it doesn’t look anything special: just a plastic strip with holes through which the bees fly in and out. Only a closer look shows the immense benefits of this innovation. The plastic strip is coated in chemicals. Whenever a bee passes through the gate, it touches the edge. This transfers a mite poison (acaricide) to the bee and kills any mites it may be carrying. The substance needs to be permanently available on the surface of the strip so that protection can last for several weeks. This proved to be a particular technical challenge. It was solved when Bayer’s scientists thought back to an earlier project: the flea and tick collar Seresto™ for dogs and cats. This innovative collar was the result of a joint venture by scientists from Bayer HealthCare’s Animal Health Division, Bayer MaterialScience and Bayer CropScience. They used a little physical trick: “The active substance molecules move between the polymer chains of the plastic matrix. They are always trying to balance out the gap in concentrations between the collar and the animal’s coat, and so rise to the surface. When some of the active substance is removed, it is automatically replenished,” says Krieger, explaining the principle. Scientists are now using the same system to protect bees: “The acaricide is embedded in the plastic. When some is transferred to the legs or hairs of a bee, fresh supplies are automatically released from the strip to balance out the gap in concentrations between the plastic matrix and the surface,” he explains. 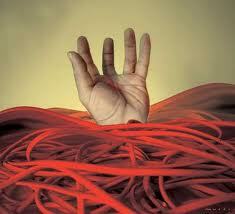 This means that the device remains fully effective for the several weeks needed for treatment. At the same time, the amount of chemical available is never more than necessary. Scientists are still fine-tuning the formulation and application rate, and are testing two Bayer substances on bee populations in the field at various concentrations. I’m a big believer in the market. And by the market I mean that place or condition where people are allowed to trade their labor and property for another’s. I’m a BIG believer in this. Where might I be wrong? And I think that where I might be stretching ideology into fact is the level at which a government might reasonably impose regulations.